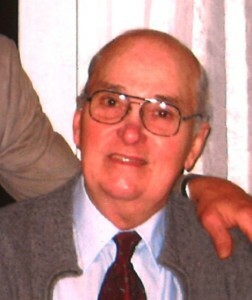 Robert E. Rathbun, Sr., 86, of Lake Shore Road, Chazy, passed away on Thursday, March 21, at his residence. He was born on March 11, 1927, in Whitehall, N.Y., the son of Marcus and Elizabeth (Greenwood) Rathbun. Robert was a U.S. Navy Veteran, serving his country from 1944 to 1946 as a Carpenters Mate on the USS Franklin Aircraft Carrier. He married the former Priscilla Hawkins of Brooklyn, N.Y. on March 26, 1950. They were about to celebrate their 63rd wedding anniversary. Robert worked at the Chazy Central School as an Industrial Arts Teacher from 1951 to 1983, retiring after 32 years of service. He was awarded the Teacher of the Year Award by his students in 1968. He loved to teach his students a variety of industrial arts and launched many of them into the successful careers they have today. He was a master woodworker and much of his handiwork is with us today. Notable among his woodwork is the cross that hangs in the Three Steeples United Methodist Church, where he was a member. For Robert, there was no place he would rather be than at home. He lovingly devoted many long hours and years to creating and maintaining Pine Acres as a beautiful, comfortable, joyous haven for his wife, children, grandchildren and friends. Robert was a Mason for over 55 years and the oldest living member from the Chazy Lodge, and a 42 year member of the Order of the Eastern Star. He was also a member of the American Legion Post #769 in Chazy, and a former member of the Elks Lodge in Plattsburgh, N.Y. Survivors include his wife, Priscilla Rathbun of Chazy; four children, Elizabeth Northrup and her husband Terry of Conroe, Texas, Robert E. Rathbun, Jr. of Chazy, N.Y., William Rathbun of Wilmington, N.C., and Bruce Rathbun of Redkey, Ind. ; ten grandchildren, Marcus Northrup and his wife Ashley, Michael Northrup and his wife Cayla, Megan Northrup and her fiancé Walter Cinibulk, Cameron Rathbun, Elle Rathbun, Tyler Rathbun and his wife Megan, Liza Rathbun, Amanda Ehrhart and her husband Nick, Karen Rathbun and Emily Rathbun; and five great-grandchildren, Mac Northrup, Georgia Northrup, Micenzie Northrup, Sophia Ehrhart, and Logan Rathbun-Besser. A Memorial Service will be held on Saturday, March 30, at 11 a.m. in the Three Steeples United Methodist Church in Champlain. A reception will follow immediately in the church hall. Burial will be at a later date in the Greenmount Cemetery in Whitehall, N.Y. Donations in his memory may be made to the Eastern Star Daycare Center located in Oriskany, N.Y. in care of Priscilla Rathbun, or to the Three Steeples Methodist Church Memorial Fund. Arrangements are being handled by the R.W. Walker Funeral Home, 69 Court Street, Plattsburgh. Online condolences may be made to the family by visiting www.rwwalkerfh.com.